SUNY Oswego's student-driven Volunteer Income Tax Assistance program, currently providing free tax-return services to local residents, recently earned perfect marks from an Internal Revenue Service field site visit. Coordinated by Beta Alpha Psi, the honor society for accounting and finance students, the local VITA program received a 100 percent score of the Quality Site Requirements in its IRS field audit -- a very impressive accomplishment, SUNY Oswego Dean of Business Richard Skolnik said. For more information on VITA tax sessions, call 315-312-2934 or email bapsi@oswego.edu. 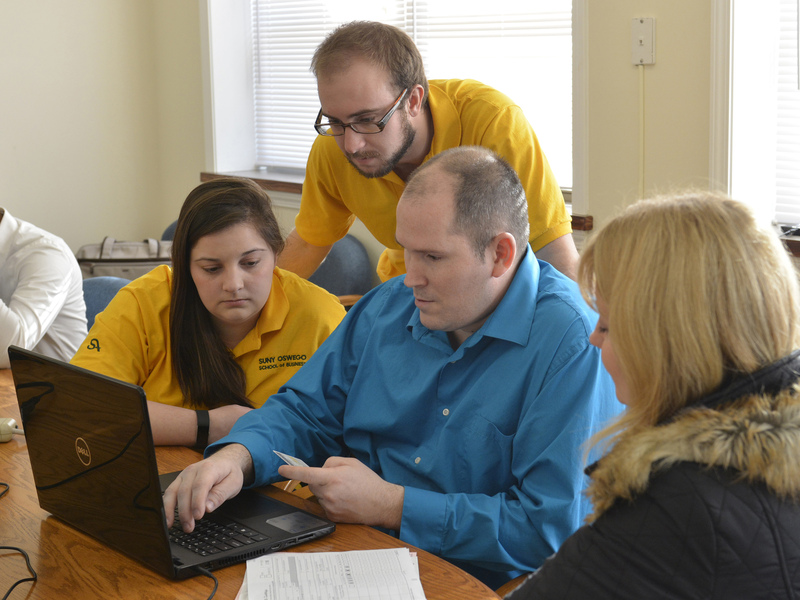 SUNY Oswego's student-driven Volunteer Income Tax Assistance program recently received a 100 percent score of the Quality Site Requirements in its IRS field audit. The free program continues in three locations through tax season. Shown working at a recent session are accounting majors (seated from left) Elena Margrey and Jason Krause, and (standing) Derek Holden.